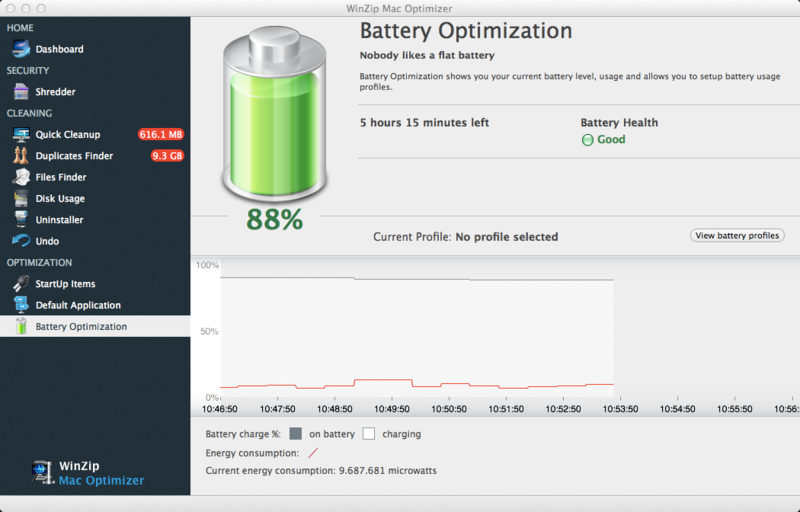 How do I set up battery optimization profiles using Mac Optimizer? The Battery Optimization feature in WinZip Mac Optimizer gives you some great insights into your battery charge level, rate of power consumption and estimated time left on battery. You can also control the battery consuming features of your MacBook based on whether it is running on battery or if it is plugged into a power source. To do this you will need to create one or many battery profiles and then activate the one you would like to use. You can create a battery optimization profile by following the below steps. You can see the current life of your battery and the battery’s health. You can also see a moving graph with your battery’s energy consumption. Click View Battery Profiles. This will take you to the screen that lists all the battery optimization profiles that have already been created. Click Add to add a new battery profile. Click the arrows next to Battery and Power Adapter to set custom values for this Mac when it’s on battery and when it’s plugged in. These custom values include brightness, volume, Wi-Fi and Bluetooth. 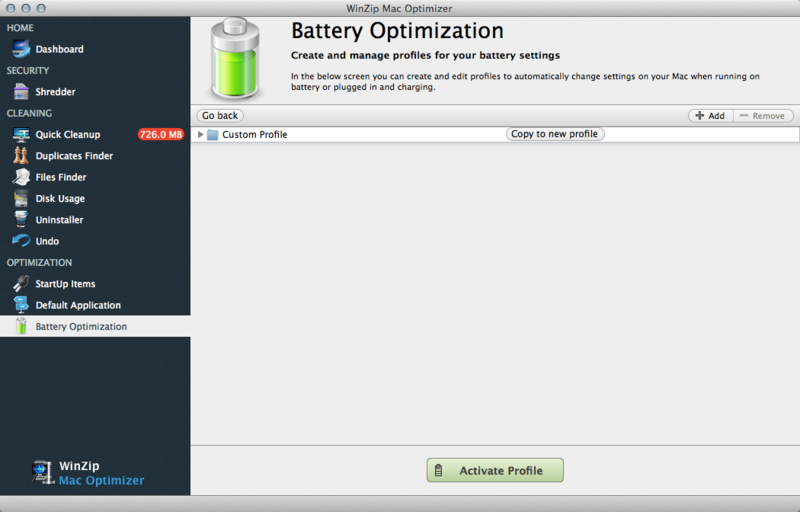 Mac Optimizer will then automatically change the settings based on if you are running on battery power or plugged into a power source if this profile is activated. Copy these values to a new profile by clicking Copy to New Profile. This allows you to have several similar profiles. When you’re satisfied with your new profile, click it and click Activate Profile. The profile will turn red. You can also remove created profiles by clicking on them and clicking Remove.